Currently, CNC Machining and Injection molding are two completely types of machining processes for many geometry shape metal parts & plastic parts, they had been widely used in various machining industries. Such as: Automotive industry, Aerospace application, Medical device, Military and Gas&Oil, Electronic industry, almost most of our daily life’s products. Different product design, requirement or production quantities we will apply for different manufacturing method based on more effective process. 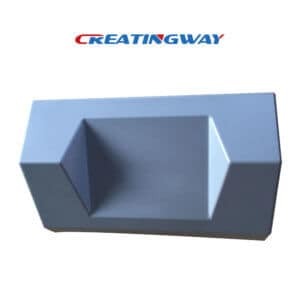 As one metal and plastic products design, machining OEM & ODM manufacturer, Creatingway takes more professional knowledge to our global customers, learning, improvement, and increase our skill ability to serve you. CNC machining- Using the cnc machine tool to produce some metal or plastic parts, and also known as the processing of cnc machine tools. CNC index control machine is controlled by cnc processing language, usually using G code. CNC machining G code language told CNC machine tool uses the cartesian coordinates, and controls the tool feed rate and spindle speed, and the tool changer, coolant, etc. CNC machining has a great advantage over manual processing. Such as: the precision and repeatability of the parts produced by CNC machining, and it also can produce some complex shapes parts that can’t be completed by manually. Whatever, your products is single part, low-volume production, or larger production, CNC machining process can meet your requirement. Quickly, economic, precision and high quality are main advantages to our CNC machining, So, many of rapid prototype, high standard product, they will use CNC machining process to complete, such as our currently hot product, phone shell, electronic shell, or some of new design product need to make prototype for verify their concept etc. CNC machining process will be better choice at present. Also, after CNC machining process, we also provide many different secondary finishing like anodizing, power coating, coating, chrome etc to make our products aesthetic, and better high level. What is Injection molding Industry? produce different plastic product process, it’s wide range used to produce almost most of plastic parts. Such as: wire spools, bottle caps, automotive parts, electronic device, our daily consumers products, Gameboys, one-piece chairs and small tables etc products, When we have considered to use injection molding process to our products, we have to make production quantities is larger, Rather than CNC machining, casting, 3d printing etc process, our injection molding process need to build mold from design, mold buidling till injection production, so will ask our more technical skill and production capability. Meanwhile, also ask our product quality control during production, using facilities to make different inspection on key dimension etc. Of course, when we make injection mold manufacturing process, also, we can make many different 2nd finishing process like painting, silk-screen, chrome, etc. to make our product appearance better. Injection molding manufacturing we will main use product more quantities requirement, economic and production speed, the main factor is still whole product cost control. So we can lanuch more new products to marketing. In conclusion, Based on CNC machining VS Injection molding Industry processing are different, the final production time & cost are also different. 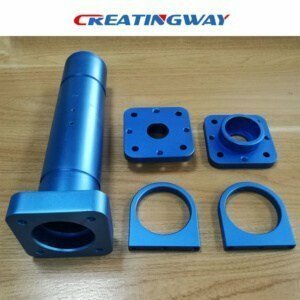 As one professional metal and plastic machining manufacturer, Creatingway will be able to provide the best suggestion and machining processes to save the production time & costs for every customer before production. Our company aim is to provide high quality cnc machining parts & effective delivery time to meet the global customers’s demands. If any needs or new metal parts projects & plastic parts projects design, machining inquire, welcome to contact us freely, will provide the best price and service for you.